You have the best of both worlds living in Will-O-Wisp community located in Bailey right off of Highway 285 and just past Pine Junction. Will-O-Wisp has a neighborhood feel with homes on community water and sewer. Mountain views are backed by open space and an average of ¼ acre lots with many including walkout basements. The area features 200 acres of recreational space that provides extensive trails, pond for ice skating or fishing, playgrounds, volleyball courts and a pond house for residents. All the outdoor amenities along with water and sewer are maintained by Will-O-Wisp Metropolitan District. Most homes for sale in Will-O-Wisp are raised ranch styles mixed with 2-story homes and floor plans ranging from 1,100-2,500 square feet. The wood constructed homes blend in with the surroundings and include car ports or attached and detached garages. Homes in Will-O-Wisp were established in 1980’s and matured through the early-2000’s with 117 affordable homes, that developed into a great community and friendly neighbors. A small, tight-knit community at elevations of 8,100-8,350 feet where wildlife roam and feathered creatures soar in the great outside space. Extremely easy commutes to the foothills or metro Denver for work or play. For your everyday needs head to Conifer Town Center or Conifer Marketplace. All the homes in Will O Wisp create a community that takes pride in ownership and a great place to live with the RTD Park-n-Ride just minutes away. See what your home is worth With an Instant Home Valuation Online. Want advice on selling your house? We provide a free staging consultation, pre-listing prep plan, and a Will-O-Wisp real estate market analysis. Call us at 303-325-5690 to learn more. New to the Area? 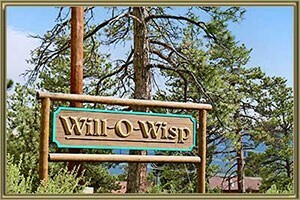 Call our Will-O-Wisp real estate agent at 303-325-5690 to schedule your tour of Homes in Bailey CO.